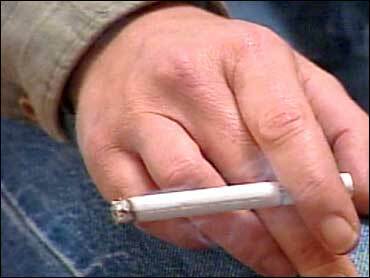 Secondhand smoke exposure may be dwindling in the U.S., a new study shows. The number of U.S. nonsmokers with detectable blood levels of cotinine — a marker for tobacco exposure — fell 70 percent from 1988 to 2002. James Pirkle, M.D., Ph.D., and colleagues report that finding in the June issue of Environmental Health Perspectives. Pirkle works at the CDC's National Center for Environmental Health. A decline was seen in all age, gender, race, and ethnicity groups studied. But children and black nonsmokers had higher cotinine levels than other groups, so Pirkle's team recommends further work to curb the environmental hazard. Data came from 14 years of national health surveys and blood tests including nearly 30,000 nonsmokers. 1988-1991: 88 percent of nonsmokers had detectable blood cotinine levels. 1991-1994: 80 percent of nonsmokers had detectable blood cotinine levels. 1999-2000: 51 percent of nonsmokers had detectable blood cotinine levels. 2001-2002: 43 percent of nonsmokers had detectable blood cotinine levels. The decline translates to a 70 percent drop in the number exposed from 1988 to 2002, note Pirkle and colleagues. Cotinine only shows tobacco exposure over the previous few days, and it may fade faster or slower in some people, the researchers write. The study tracked three racial/ethnic groups: blacks, whites, and Mexican-Americans. Cotinine levels dropped for all groups. But blacks had higher cotinine levels than whites or Mexican-Americans throughout the study. The reasons for that pattern aren't clear. Metabolic factors might account for some of the difference, the researchers write. Children's cotinine levels also fell but not as much as in adults. The study doesn't pinpoint a reason for the smaller decline in kids. Children living with smokers may be exposed to tobacco at home, in cars, and in other settings, Pirkle's team notes. The decline "probably reflects the substantial progress made in reducing the exposure of nonsmokers to [secondhand smoke] during this time," write Pirkle and colleagues. The researchers call for increased intervention efforts to cut secondhand smoke exposure among kids and blacks. More work may be needed "to further encourage restrictions on smoking in the home, automobiles, and other locations when children are present," they write. SOURCES: Pirkle, J. Environmental Health Perspectives, June 2006; vol 114: pp 853-856. News release, Environmental Health Perspectives.